The Tour of Qatar starts with an individual prologue time trial for the first time in its nine-year history, having begun with a short team time trial since 2007. Its 2km length might not be enough to have a major effect on the overall standings at the end of the race, but it should be enough for World time trial champion Fabian Cancellara to give the new Leopard Trek team its first victory. The rest of the race should be given over to the sprinters, as with virtually no geographic features on the course it’s very rare that a breakaway is ever successful. Most of the riders that have been contesting the Santos Tour Down Under will be stopping off in Qatar on their way back to Europe, and they will be meeting many of those who stayed behind. 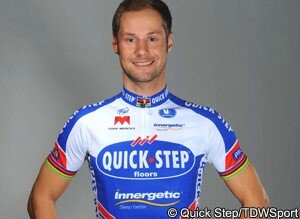 Tom Boonen (Quick Step) holds most of the records for the race; he has the highest number of overall wins (3), the highest number of points jerseys (5) and the highest number of stage wins (18!). The Belgian sprinter will be starting his season with the race and will be looking for a morale boosting start to 2011 after such an unlucky 2010. Boonen will also have new Italian teammate Francesco Chicchi alongside him, and prodigal son lead out man Gert Steegmans to look after him in the last kilometre. Mark Cavendish (HTC-highroad) will be the man to beat, as usual, although it was his Aussie teammate Goss that took two victories Down Under last week. Alessandro Petacchi (Lampre-ISD) is due to start his first Tour of Qatar since 2007, when he scored three second places behind an unstoppable Boonen. The Italian may well be a late withdrawal, or at least a little off his best though, having withdrawn from this weekend’s Giro della Provincia di Reggio Calabria with bronchitis. What will be interesting to see is how well Andrea Guardini (Farnese Vini-Neri) fares against such quality opposition. The 21-year-old is currently unstoppable in the Tour of Langkawi, having won three of the six stages so far, but against less illustrious names as these. Missing from the list of starters is last year’s winner Wouter Mol, whose Vacansoleil-DCM team is not in the race this year.